Don’t Wash Your Chicken: What’s the Cluck? 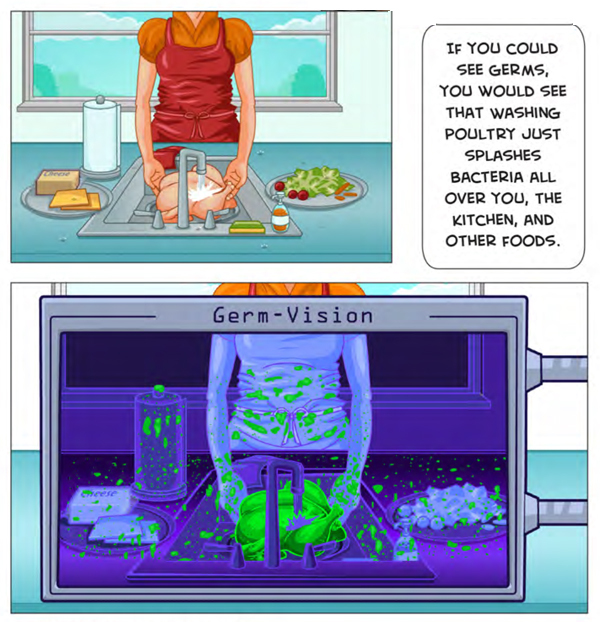 The “Germ Vision” graphic from the “Don’t Wash Your Chicken” campaign illustrates how bacteria can splatter when raw poultry is washed. The “Don’t Wash Your Chicken” food safety campaign developed by Drexel researchers in collaboration with New Mexico State University has made a big splash in the news over the past week or so – and people keep talking about it. Lots of questions about the advice have come up again and again in discussions both online and offline. And a lot of people insist they’re not going to stop washing chicken. Have a chicken-washing question or objection you haven’t seen answered? Head over to the BarfBlog, where food safety experts, including blog author and North Carolina State University assistant professor Dr. Ben Chapman, are at the ready to answer your questions in the comments section. There is considerable evidence both in the US and from across the globe that health communication campaigns are an effective way to promote both behavior and social change across large populations. This is true in relation to reduction in health risk behaviors (for example: tobacco, alcohol and drug use) and also promotion of positive behaviors and norms (use of seat belts and child survival).